The Castle Class were an enlargement of G. J. Churchward’s Star Class and were designed by C. B. Collett, with the first appearing in 1923. The class was added to over the next 27 years, eventually totalling 171 (including the rebuilds), with many changes being made along the way. Caerphilly Castle was the first of the ‘4073’ class to appear. The main frames were joggled at the front to clear the leading bogie wheels and like others of the first batch it was fitted with bogie brakes, which were soon removed. No. 4073 had a unique angled rainstrip on the cab roof. In 1924 Caerphilly Castle was displayed at the British Empire Exhibition, at Wembley, end-on with LNER’s No. 4472 Flying Scotsman. The Great Western declared that their locomotive was more powerful than its bigger LNER rival, which in terms of tractive effort was correct. 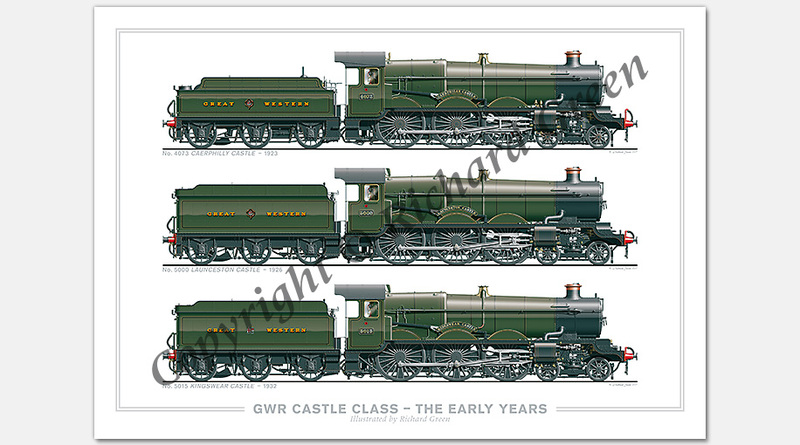 It is in GWR Green and is attached to a Churchward 3,500 gallon tender with garter coat-of-arms. Built: (Swindon) August 1923. Withdrawn: May 1960. It has been preserved. Launceston Castle had straight frames with a dished area to avoid the front bogie wheels, which was introduced with No. 4093. Because of this the inside ‘Vauxhall’ cylinder cover was wider. No. 5000 was loaned to the LMS to run trials between Euston (London) and Crewe and then between Crewe and Carlisle. This was a success and the LMS enquired if the GWR would build a batch of Castles for them or supply a set of drawings; both proposals were rejected. It first appeared attached to a Churchward 3,500 gallon tender, but when it was chosen to go to the LMS this was exchanged for a new 4,000 gallon Collett tender (Lot A113) which differed from later versions with, among other things, double fillers and long spring hangers. 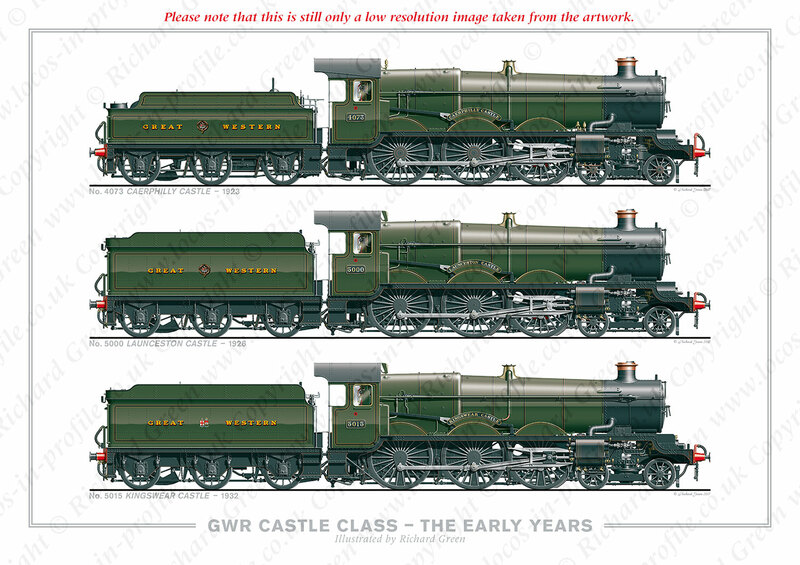 It is in GWR Green with garter coat-of-arms on the tender. Built: (Swindon) September 1926. Withdrawn: October 1964. Kingswear Castle was from the first batch of the ‘5013’ class. These had a number of differences from earlier Castles, among which were; a redesigned firebox with wider water spaces, individual ‘J’ hangers for the springs, plus a ‘square’ inside cylinder cover with a curved front edge. The coupling rods now had the joint behind the crank pin and the coupled wheels had the crankpin between the spokes, along with reinforced webs. The ejector elbow now incorporated a water separator along with a drain pipe. The bogie frame was of a strengthened design. The sanding to the front of the middle coupled wheels was removed and sanding to the back of the trailing coupled wheels added, the sandbox for which was hidden under the cab. They also had 5-glass sight-feed lubricators. A fire iron tunnel was fitted to the fireman’s side. It is in GWR Green and has a 4,000 gallon Collett tender with twin shields, introduced in 1927. Built: (Swindon) June 1932. Withdrawn: July 1962. The above information is supplied with the print.